Hello, all! In my quest to be as white girl and fall as possible, I have made it my mission to start cooking as many fall inspired dishes as possible. Be sure to check out my full Fall Bucket List here. :) I have only created one dish and it's hella easy, but I've at least started on my mission! Last weekend, my boyfriend and I made Pumpkin Snickerdoodles and oh my god were they amazing! Just the perfect amount of pumpkin spice with a light, fluffy center. I couldn't stop eating them! This recipe is so yummy and easy, a 12 year old could create these with no problem whatsoever! ( I don't know what that says about my cooking abilities, but I'm going to roll with it). SOO, if you're in the market for an easy, festive fall treat this recipe is perfect for you! I actually came across this recipe for pumpkin snickerdoodles on Certified Pastry Aficionado! Her blog is absolutely stunning and her recipes look even more amazing. I was thinking about trying to recreate her Apple Pie Cinnamon Rolls. Her pictures look so mouth watering & I do love a good cinnamon roll, but, alas, that was far too adventurous for me for the first time around. If you're ever in the mood to bake and don't know what to create, I would highly recommend checking out her page! Any-who, off to the recipe! Mix together the flour, baking soda, salt, cream of tartar (not the soup lolz) and spices. Add the softened butter and pumpkin puree and mix until thoroughly combined. Place scoops of cookie dough on a greased cookie sheet until all of the dough is gone. Here's the kicker guys, you have to refrigerate these bad boys for 8 hours. I know, I know, I was super saddened when I realized I would have to wait so long before enjoying my delicious creation, but it is a necessary evil. Bake in preheated oven for 10-12 minutes and voilà! A delicious fall treat perfect for crisp afternoons reading your favorite book or family dinners. YUM! I think the best thing about fall is all the treats and this is so perfect! I'm right there with you! I love fall treats :) They're so warm and homey! YUMMMMM. I pinned this and am super excited to try these out this weekend. Thank you! OMG These look SO good!!! I can't wait to try them! These sound so yummy! This recipe will come into Fall goodies repertoire! Thanks for sharing! Oh my goodness these look delicious! These look/sound delicious! The perfect flavor for fall! I LOVE snickerdoodles and in the perfect fall mood, I am loving everything pumpkin! These look great, thanks for sharing! Me too!! Snickerdoodles are such a classic & perfect for fall with the pumpkin twist ! I love pumpkin especially when it comes to cookies!! If you are looking for a more challenging Fall dessert then check out the cake I'm posting tomorrow ;) it's got apples and caramel..yea you can't go wrong! I'll definitely have to check it out! I've been in search of another recipe to try out and I LOVE apples and caramel. It sounds so yummy already!! Oh my goodness these look amazing! My favorite fall recipe is apple crisp. Its so easy but maybe I'll change it up and make these! Now that you mention it, I LOVE apple crisp! I've never made it myself, tough. Maybe I should try that one out! These are perfect flavor for fall! Okay pumpkin is my favorite and I LOVE snickerdoodles! Perfect combo!! These look absolutely amazing!! I would love to make these this weekend! I hope they turn out yummy for you! These sound delicious! My family love my snickdoodle cookies. Putting these on *to try* list! Yum! This looks absolutely fantastic! I like snickerdoodles so pumpkin snickerdoodles would be a fall favorite. My family LOVES snickerdoodles. Adding pumpkin? Genius! That looks deliciously like a must try and perfect for the season! Thanks for sharing! Can't wait to try these! Ooooh yum! Just when I thought I had seen everything pumpkin. Can't wait to try these! I saw this post and thought "Ohhhh let me see if her pumpkin snickerdoodles are similar to mine!" and then I see that yours were inspired by mine!! What an honor! I am so shocked! Thank you so much for the kind words. They truly made my MONTH! Your cookies looks amazing! Keep up the amazing work and knock more stuff off that bucket list! Making these for real. Thank you for the recipe! Snickerdoodles are so good on there own, I can't wait to taste then with pumpkin! We love snickerdoodles and this pumpkin version has got to be delish! What a delicious combo! I love snickerdoodles and I love pumpkin! I couldn't imagine a better mix! Snickerdoodles and Pumpkin? Oh, YES! These cookies look amazing and I can't wait to give them a try this weekend. Thanks for sharing! These look and sound so good! Can't go wrong with the combination of pumpkin and snickerdoodle since the cookie already has some of the pumpkin pie spice in and on it. Thanks for sharing. 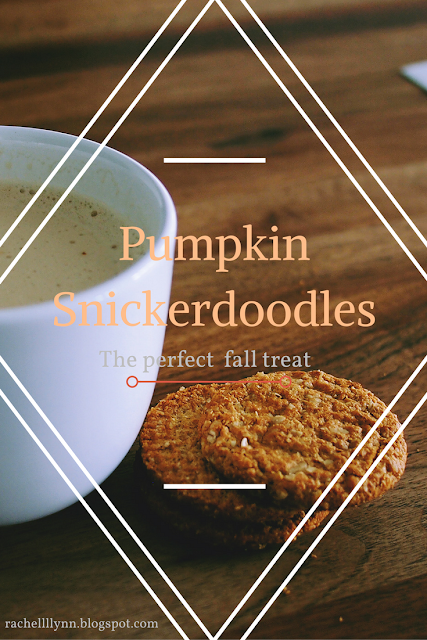 This post is like my heaven because my favorite cookie is a snickerdoodle and I love pumpkin flavored anything! Definitely saving this to make!! Thanks for sharing! These sound absolutely amazing! I've been baking so many different recipes using pumpkin, so I'll be adding this one to my list! Thank you for sharing this, Rachel! I also like pumpkin . So much thanks . Hey there & welcome to my blog! I'm Rachel. I love iced coffee, cats, novels, twinkle lights and leaving my window open. Here you'll find everything from fashion inspiration to city adventures. I'm just a girl trying to find her way through life and sharing my experiences with you. Enjoy! Don't Forget To Subscribe to My Blog!